Let’s face it. You really can’t hope to experience a long, happy life without growing older. But here’s the problem: for most of us, our mental picture is not too pretty of life beyond (fill in the blank with whatever age you think is “old”). And over 80, 90 or 100? The image is even worse. We love the idea of living a long, happy life, but no one wants to grow OLD. Old age scares the heck out of us. "Happy Healthy…Dead: Why What You Think You Know About Aging Is Wrong and How To Get It Right" shows you what sets apart those who are enjoying life in their later years from those who lament their every waking moment. 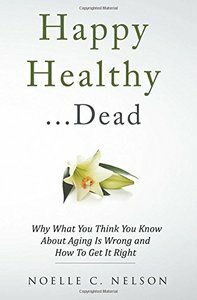 It includes extensive scientific research proving how vital our current thoughts, emotions and attitudes are to our ability to experience a long, healthy future, plus real life examples of seniors living happily in their 80s, 90s and beyond. Finally, the book explains what you need to do to assure a long, fulfilling, healthy life. Our time on Earth may be finite, but nowhere is it written that our last 10, 20 or 30 years must be spent in decline and misery! Why not make sure you’re on the right path, right now, that will bring you the most happiness, health and longevity?